You’ve probably come to this website because you’re not happy that your last listing agent failed to sell your Ann Arbor area home. 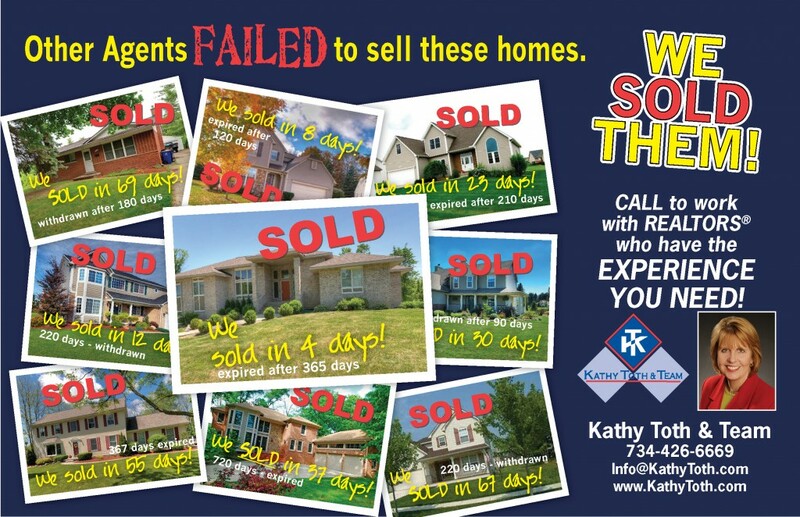 At Kathy Toth and Team, we’ve had amazing success with people just like you – people who tried to sell their home with one, two even three agents who couldn’t get the job done. When they chose to work with us, we sold their home and we did it for top dollar and in a shorter time frame than it was on the market when it expired. Our Team has tools like the Guaranteed SOLD Program and the Immediate Cash Buyout Program to create more demand for your home that gets more buyers through your home. Ultimately, the more people that see your home, the quicker it sells and the more money you put in your pocket. In addition to these programs, we offer a full-service programs to buyers. The Love It or Leave It Plan attracts the largest number of buyers in Washtenaw County because it eliminates the fear of making a poor choice. We get buyers the best homes for their needs at the best possible price, terms and conditions. Because of the VIP Buyer Program and Guarantee, sellers are able to expose their homes to a larger number of pre-approved, willing and able buyers who are looking to buy now. As part of the program, buyers are able to save money on their mortgages, get Home Warranties on their new home and potentially save thousands of dollars at closing. If you are a seller, you want to sell your home to one of our Selling Team buyers because they are the most qualified home-buying prospects in the area. If you are a buyer looking to purchase a home, you get the widest selection of homes from which to choose because Kathy Toth is one of the most successful listing agents in the area. You get advanced notice of coming soon homes. It’s simple; our goal is your goal – get your home sold in a reasonable time frame and for the most amount of money with the least amount of hassle. That’s it. No gimmicks. No hassle. 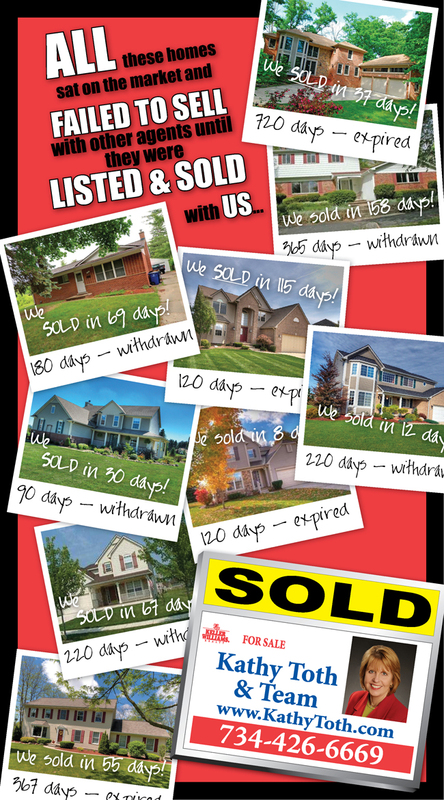 Ask for a current list of homes I’ve sold over the past few years that other agents tried to sell and failed. 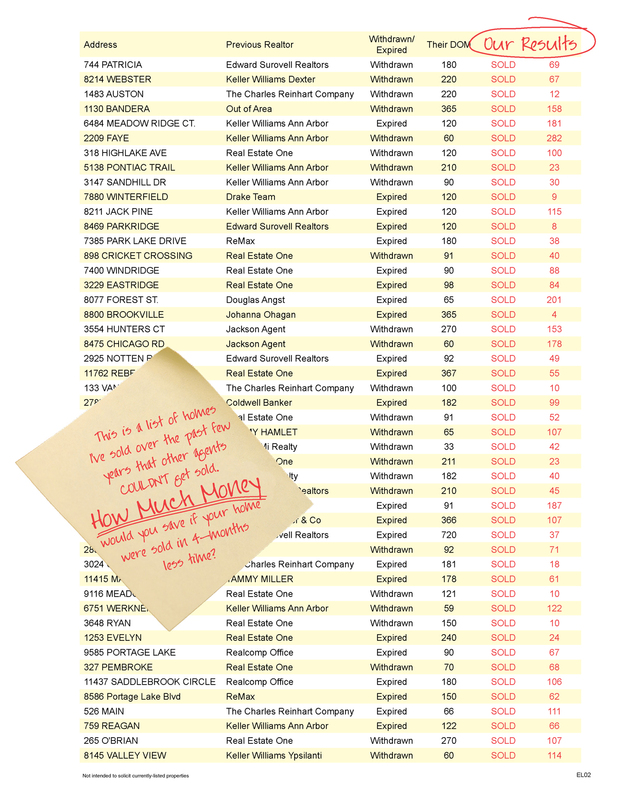 We’d love to show you how you can get your home on that list, too. Please contact us so we can call you back immediately to show you how your home will sell this time. Or, you can call our office at 734-426-6669 to talk to one of the Ann Arbor Real Estate Experts now.